V90 and S90. Meet the designers behind the detail. Inspired by the Scandinavian mindset, Maximilian Missoni and Tisha Johnson describe their approach to the interior and exterior of the new V90 and S90. 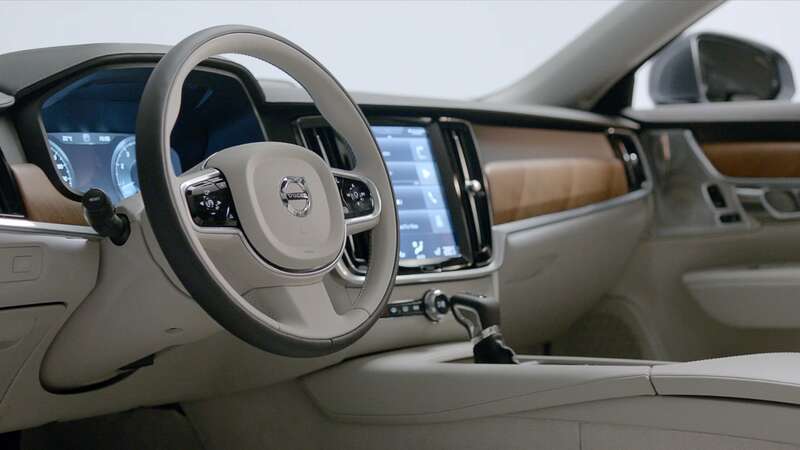 Maximilian says the confident and powerful looks of the S90 and V90 were born out of Volvo Cars’ new scalable car platform, known as SPA. It enabled the designers to push the front wheels forward, creating dash-to-axle space (the distance between the centre of the front wheels and the vertical line where the windscreen intersects with the bonnet), lending it very powerful, premium proportions. The modesty that is embedded in Swedish design is extremely modern. Swedish life is, by nature, a kind of luxury. The country is unspoiled. Forest, lakes and ocean are available to all. Our aim is to bring this uniquely Swedish experience to customers. That feeling of airiness, light and space is especially noticeable in the V90 – an elegant estate in a very modern way. Tisha, an American, describes it in the same terms as the open space you get inside a Swedish home; the roof allows light to flood in, like the skylight over a staircase. Well-designed seating is a feature of many Swedish homes. Slender front seatbacks in the S90 and V90 are sculpted to give more knee room for rear passengers, yet provide the safety and ergonomic support you’d expect from Volvo Cars. Explore the elegant design language in the pinnacle of the modern estate.